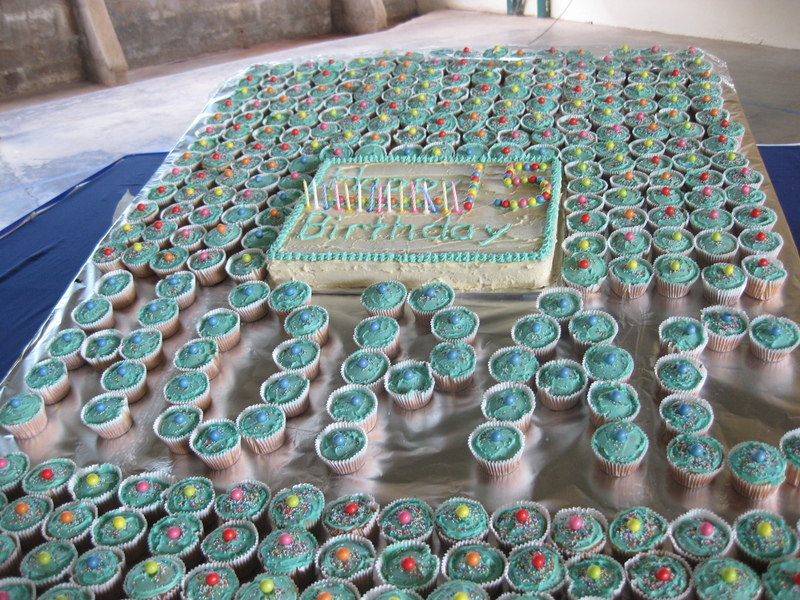 Haven of Peace Academey, aka HOPAC, celebrated its 15 year anniversary in March.The celebration was complete with a slide show of from the beginning days of HOPAC until today, alumni speakers, a representative from the Minister of Education’s office speaking, our Tanzanian staff singing and dancing, a student performance of How Great is Our God with sign language, a cupcake birthday cake for all of the students and staff, and jumping castles. It really was a day to praise the Lord for how much He has done in such a short time at HOPAC! Happy Birthday HOPAC! May there be many, many more years of blessings to come! 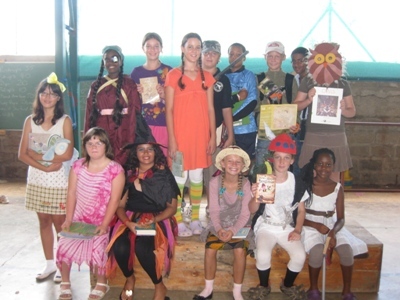 Each year at HOPAC the student council puts on BOOK WEEK. This is a week completely dedicated to Reading. I must admit at first I was a bit skeptical about the week, and thought it would be a bit corny, however, it proved to be a very fun and memorable time. We began the week with a kick off assembly, where the student council members put on a skit about reading. It was super cute and they did a wonderful job. That day each student made a poster about why they love to read. The posters were hung around the school which really added to the week. All throughout the week we had a DEAR bell. Drop Everything And Read. Anytime it rang the students had to stop what they were doing and read a book. The second day was Buddy Reading day. We all came in our PJs or comfy clothes and brought along our favorite pillow or stuffed animal. In the afternoon we read with one of the other primary grades. The students really loved it and I really enjoyed seeing my older kids hanging out with the younger primary kids. On the third day we held a book exchange. At the beginning of the week we, asked for the students to bring in any books that they no longer were reading and they could exchange 2 for 1 new book. All of the leftover books were given to a local school with very little resources. This was all organized by our first graders. So precious. The final day was Book Character Day. Everyone is encouraged to dress as their favorite book character and bring in the book they chose. The kids really love this day! 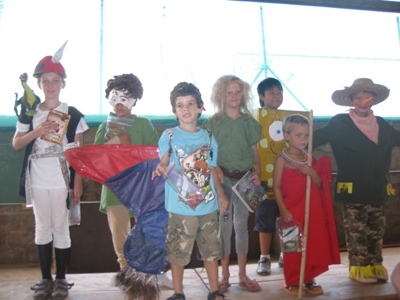 Parents and kids go all out, to create some awesome book characters. 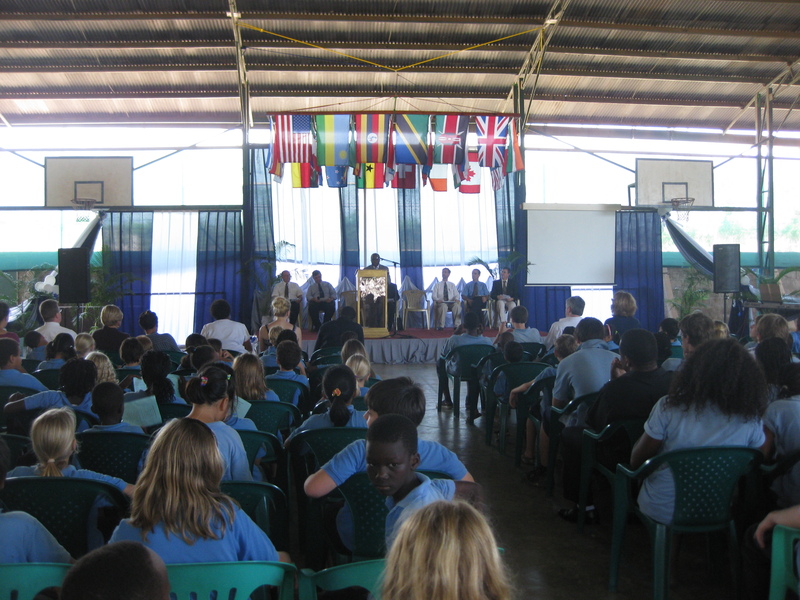 At the assembly there is a big competition and secondary students vote on the best from each grade. It was so fun to see all of the different characters that came about. We had the Hunchback of Notre Dame, Sponge Bob, 101 dalmations, Pipi Longstocking and so many more. Overall, it was a great week and a great way to promote the love of reading! I give it two thumbs up! The Champions from each grade. 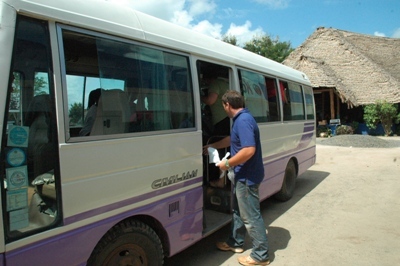 On the trip to Amani, we were short just a few seats and some room from all being able to fit on a big “charter” bus. 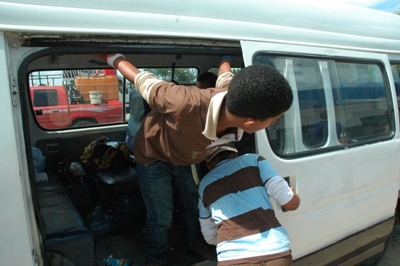 Unfortunately, we did not fit and therefore a group of us had to travel on a dala dala the entire 8 hours to Amani. To be fair the nicer bus was not exactly comfortable either, however, I would have much preferred to be on that bus. Coming from the land of plenty, where we have pretty much always had a nice big charter bus this is definitely a different way to travel. No comfortable, cushioned seats. No TV’s to keep the kids entertained. No bathrooms to make it so you don’t have to stop for a potty break. No microphone so that you don’t have to yell over the kids to get attention. No rest stops along the road or McDonald’s to get a break from it all. And no air conditioning. Instead, Austin and I traveled with a small group of boys from my class squished in a dala dala. In all honesty, it was not pleasant, but it was doable. I would say the major bummer about it was the metal bars you can feel underneath your bum, which make you numb after just a short while, and you and your stuff being covered with an inch of dust because in order to get fresh air you must keep the windows down at all times. On a more positive note, our driver was one of the safest, and more alert drivers I have had in Tanzania, which made me feel much better about having my students in the car too. From this 35km sign it took us 2 HOURS to get there! 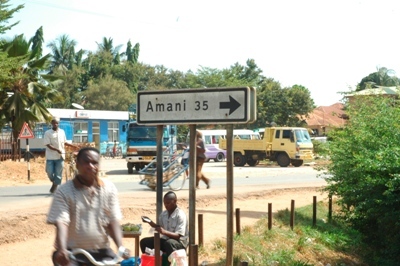 I believe it was the first day of school that I got the question, ” When are we going to Amani?” My students have been excited to go to Amani since the very beginning of the school year. I must have answered hundreds of questions about this 4 day trip. For example, “Are their going to be real toilets or squatty potties there?” “Do we have to bring hiking boots or can we wear trainers?” “Why can’t I bring my cell phone?” “Is it okay if I have already packed my bag?” (3 weeks early) and the list goes on. I made them hold off until the week before or else I am sure there would have been more. 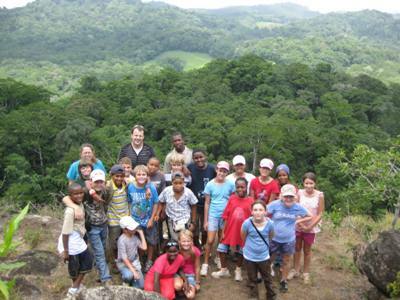 Each year the fifth grade class at HOPAC, has the awesome opportunity to go to the Amani Rain forest. 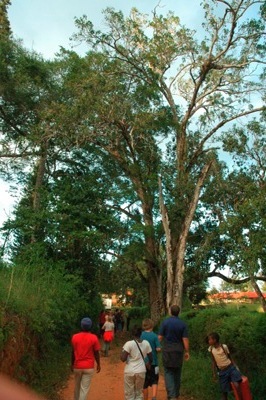 For the entire second term we study the Rain forest, so it is quite convenient that we have a rain forest not too far away from our school. 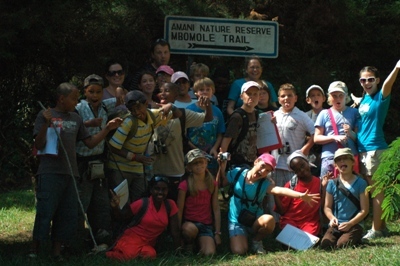 By the time we left for Amani the students had been studying the rain forest for 6 weeks and had a pretty good basis of information about where we were about to go. The adventure began with an 8 hour drive along the unpredictable Tanzanian roads. After two bathroom breaks, two break downs, and 2 hours up a winding dirt road, we finally arrived. It was incredible getting out of the car and seeing the beautiful rain forest trees towering over you, with the craziness of the city left behind. 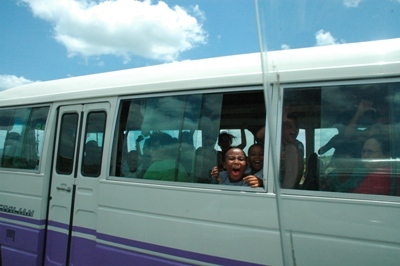 The kids were so excited from the moment we stepped off the bus. Our first "hike" more like a bit of a leg strech but beautiful none the less! We began with a short tour around the building with our guide Lucy. We saw some monkeys right away which was super fun! 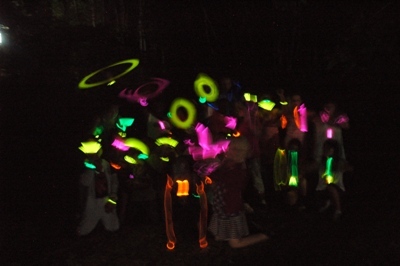 We had a homemade dinner and then got to play some night time capture the flag. It was so fun but brutal to say the least. So maybe some kids were bleeding and crying at certain points in the game, but I think it is fair to say that all had fun.Then it was off to bed. The second morning we woke up early and had a great devotion about God’s creation. Then we headed up the Mbole Trail hike. We had the kids do a scavenger hunt in hopes to slow them down on the trail, apparently classes in the past needed it. My class however, took this very seriously and only went about half a km in about an hour. After some poking and prodding, we got them to move along a bit faster. The last bit of the hike was a bit steep, but I was not complaining. I do not get to go hiking anymore so this was a major treat! 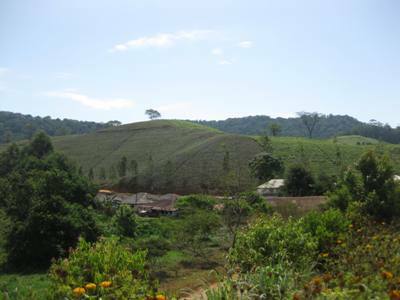 Then we got to the top of the big hill, where there was an incredible view of the Rainforest valley. It was breathtaking. What was most exciting was hearing my student’s reactions to it all. One student even said, “It is like what you see on TV, but right there in front of you!” Many of my students have not done much traveling or spent a lot of time in nature so this was a big deal for them. The Lookout after our big hike. After the hike we had a nice lunch and then headed straight to the WATERFALL! Yup that’s right we got to play in a waterfall. Once again my kids were in heaven! Although the short drive and hike were a bit precarious, it was so worth it all. After lots of fun in the falls we headed back for dinner. 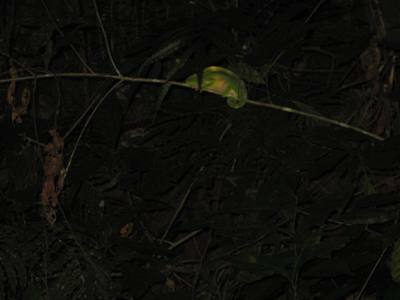 Once it got dark our guides took us on a night hike, where we saw many different types of chameleons. So cool! Lights out. 3 Horned Chameleon on the Night Hike. In the morning we woke up and headed out to see the Tea Factory and Butterfly Farm. Short bus ride and we were there. The tea fields were very pretty but unfortunately they were cleaning everything out everything was shut down for the day. My poor students had to sit through a long detailed, non-kid friendly, explanation of the tea making process. It would have been much more interesting had the machines been up and running. Then we went to the butterfly farm. This too was a bit of a flop but the kids did get to see some butterfly eggs, pupa and a few actual butterflies. We also some some huge Jack fruit which looked great but did not taste as good as they looked. We headed back for lunch. In the afternoon we played some field games. The kids had a great time running around and just being kids. We were supposed to play in a near by stream but there was not enough water. So what did we decide to do…. go back to the WATERFALL of course! The kids were all for this. Once again we splashed, and played. Then we ate our last dinner and prepared for the first ever “Amani’s Got Talent.” The kids cooked up some dance routines, shadow puppet plays, singing songs, and of course the choreographed chaperon Boom Boom Pow Dance. 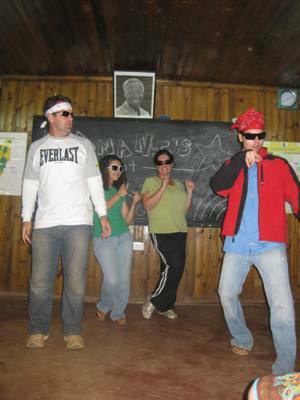 We ended it all with a dance to all of the classics; YMCA, Electric Slide, Chicken Dance, and much much more. Boom Boom Pow Routine for the kids. After the talent show we headed outside for a campfire. We laid by the fire and told funny jokes and stories and then sat back in awe of the wonder of the stars. So peaceful. So filled with the presence of the Lord. Afterward, we headed back to our cabins. The boys told some scary stories and Austin and Shaun scared the boys by sneaking up on them. The girls and I, painted nails and talked girl talk. It was so great to play less of a teacher role and more of a friend and older mentor role. Of course, it would have been much to easy to just stay up late and have fun. Around 11pm two kids just started throwing up. An hour later a few more kids started puking. We knew instantly it was food poisoning. I was in mom mode, cleaning up after the kids all night. However, the kids were champs and didn’t complain at all. Needless to say the bus ride home was a bit longer with kids puking until about half way home and the heat and being a bus for eight hours. Thankfully, we made it home safe. Really overall it was AMAZING! No complaints. 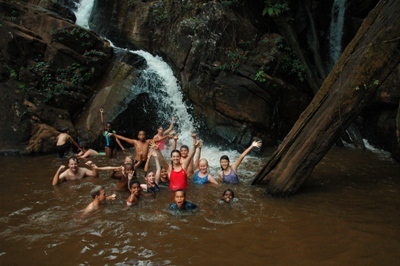 It was so fun hanging out with my kids in the rain forest!